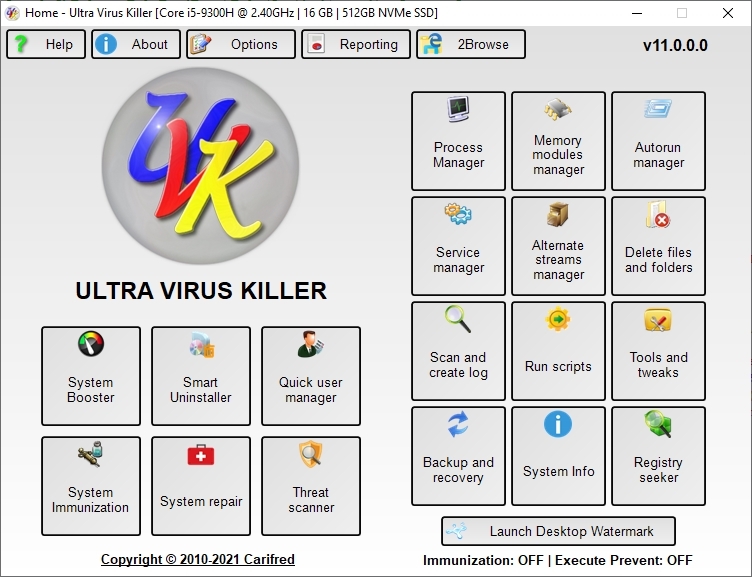 UVK - Ultra Virus Killer bundles advanced tools to repair, clean, boost and optimize Windows. With user friendly interface, UVK allows users to easily remove all kinds of malware, and perform all tasks related to Windows repair, maintenance, optimization and info retrieval. the free version is 10 stars !!!!!!!!!!!! Lots of features need licence. This is crippleware, not freeware. Does what it says on the tin and a whole lots more. 5 Stars for the free aspect but the interface is a little mixed up for the average user, else very good. Like a fool, I jumped into this program and spent lots of time trying to flush this garbage out of my system. It seems you have to know what you're doing with UVK, but the program gives you no indication of that. Getting FF to come on screen properly was a nightmare. Do me a favor and don't bother with this nonsense. this is just a geek toy. I see nothing that scans/cleans/quarantines/deletes viruses (virii).